Winter has been teasingly indecisive lately, leaving snow-lovers alternately giddy with powdery joy or grumpy with LOSS (Lack Of Snow Syndrome). Red sky in morning... will it be rain or snow? The season of cold and white made an early visit with snowfall at the end of October, enough of the white stuff to inspire skiers to dig out the boards and hike to ski what we like to call the fast grass – that skim layer of white barely covering the not-quite-frozen vegetation below. October snow is not all that unusual around here. North Country kids know they’ll likely have to wear snow boots to trick-or-treat, and plan their Halloween costumes to allow for plenty of layers. It’s also not unusual for that October snow to melt quickly, which this year’s did. But November was another story. Multiple dumps of heavy, sticky, lovely snow inspired some to nick-name this month of Thanksgiving “Snowvember.” Before it was time to feast with family, my kids had constructed multiple snow figures in the front yard, honed their snowball-throwing skills, and taken countless laps on the sledding hill. The scene was complete winter wonderland, with snow-draped evergreens and glistening snow-covered fields. By the time Thanksgiving hit, it felt – and looked – like January. The skiing was fabulous, the plow had been put to work multiple times, and the cross-country tracks were set through the woods. December, too, started with promise, although little new snow. Skiing on the mountain remained fabulous, and mainly cold temps meant snowmakers kept adding to the base. The track through the woods got a bit crusty, but it was still skiable. The heavy stuff finally melted off the trees, but the mountains remained winter white. Occasional flurries kept the landscape sparkly. All was, if not calm, at least bright. Until last Friday. Just in time for the Winter Solstice, the rain came. It didn’t just rain; it poured. For a while that morning, it poured through sunshine, and there was a rainbow arched across the sky. I love rainbows. But not in December. Small rivers of water flowed down the thick ice on the driveway. The kids’ snowy creations, which had lasted for weeks, dissolved into sad piles, then disappeared entirely. Green grass emerged in the yard, and the stalks of put-to-bed perennials poked out from the front garden. “Great. We’re going to have a brown Christmas,” one of my children proclaimed glumly as they were sprung from school for winter break. There is nothing so cantankerous as a snow-loving kid on a rainy day in December. At least the big warm up came when the kids were considerably distracted by the coming of Christmas; only the promise of anticipated presents could combat that disgruntlement. As I watched the dreary weather through the bright Christmas tree lights, I knew the woods would soon be a mucky mess, and I wondered what was happening at the mountain. I found out the next day, and it wasn’t pretty. Where a few days before all had been white, tinged with green boughs of fir trees, now there was entirely too much brown. All the natural snow was gone. But where the snowguns had been at work during colder days – and nights – the trails were still covered, and I was thankful for the wonders of modern snowmaking and grooming. After two days of rain, the crews had put the mountain mostly back together, and the skiing Sunday was surprisingly pleasant. A cool down and a skim of snow had turned the summits to frosty white again, even if the yard remains devoid of snow. The forecast looks like cold and a bit of snow in the near future. All’s well that ends well, right? Here’s hoping Winter is done teasing. Original content by Meghan McCarthy McPhaul, posted to her blog, Writings From a Full Life. This essay also appears as Meghan's Close to Home column in the December 28, 2018 issue of the Littleton Record. “You seem so excited about getting the Christmas tree this year,” one of my girls said to me last week as we sorted through our box of ornaments and contemplated where to hang each one. While some Decembers the tree trimming can seem as much holiday chore as happy tradition, it’s true that this year I was eager to get the tree up, to insert that key symbol of the season into the living room. I figure this is because I can feel the shift of this season in my children, from pure magic to – well, whatever comes after the magic fades. And because I ran into a mom of older kids, the day we got our tree, who said her offspring don’t even want to help decorate the tree anymore. And because I remember getting there myself – reaching the age, somewhere in teenage-dom, where I didn’t really want to help with the tree anymore either, when hanging ornaments onto needled branches felt more tedious routine than joyful ritual. My kids aren’t there. Yet. But I can see the writing on the packaging of Christmas future. So I am embracing this season as much as I can – and trying not to let the bittersweet-ness of growing-too-fast children seep too deeply. Instead of dwelling (for long) on the photo from five short years ago that popped up on my computer screen recently – the one of my now-non-believing son writing his annual missive to Santa in large, uneven, red and green letters – I focus instead on his sister’s excitement of getting the Christmas decorations out and strewing them about the house. Rather than worrying (too much) about the littlest exclaiming incredulously that so-and-so doesn’t believe in Santa OR elves, I focus on her sleepy-eyed fascination each morning with finding our own magical elf, Jingle. And try to ignore the fact that she’s already let go of the Tooth Fairy and the Easter Bunny, so Jolly Old Saint Nick is the only one left. Although this season is busier than busy, I try (with occasional success) to step back, take a breath, and focus on the joy – and the goodness of that busyness. How lucky to be busy with things that I love – writing and coaching and being Mama – even if many dark winter mornings I long for a few more cozy minutes snug in bed. Beyond the deadlines and shoveling and bills I wish I could ignore, there is skiing and cookie-making and finding and wrapping gifts and eating good food with people I love. My house smells like Christmas trees and ski wax – two of the happiest smells I know. And it sounds of children, sometimes fighting – with me or each other – but also sometimes, often, laughing and sharing stories and discussing which decoration should go where. Shining lights fill the season – on the tree in my living room, from the glint of sunlight off snow, and shimmering in the so-dark winter sky. The other night, as we were driving through that darkness, my daughter looked out the window at the countless stars twinkling from an unimaginable distance away from our car, our town, our planet. Perhaps, then, the magic of this most wonderful time of the year doesn’t fade so much as it shifts. Maybe it’s there to be found, no matter what form of magic we believe in, if only we look the right way, in the right places. Original content by Meghan McCarthy McPhaul, posted to her blog, Writings From a Full Life. This essay also appears as Meghan's Close to Home column in the December 14, 2018 issue of the Littleton Record. When my youngest was a baby and the older kids toddlers, I used to load them all into the car – which back then entailed buckling three little ones into cumbersome car seats – and go for meandering late afternoon drives. We’d cruise the neighborhood by minivan, looking for farm equipment and horses along the way, so these tours became known as Pony & Tractor Rides. The timing of these outings was entirely based on the littlest one’s need for a short snooze between naptime and bedtime. Things were just easier – for everyone – if she slept for 20 minutes, but the only way she’d sleep at that time of day was in a moving car. Sometimes she’d be asleep before we left the driveway, and the ride could be a short one. Sometimes it took a couple of miles, so the tour was extended. Sometimes there was no sleeping at all. But there was quiet. At least that’s the way I remember it. And as any parent of small children knows, there is immeasurable value in a few minutes of quiet. The path we followed changed a bit based on the timing and my whim, but we had favorite routes. Often, we drove out the Easton Valley, where we’d pass cows and tractors and the occasional hay wagon at Pinestead Farm and possibly an old grader or some other interesting piece of equipment near the Franconia/Easton town line. A right turn a bit further along would bring us up Sugar Hill Road, where we knew we’d likely spot a pair of old, retired mares and a couple of older, not yet retired John Deere tractors. From there, we could pass by the Stewart Farm and look for more horses near the stables down the road. Or we could loop around and drive past the old Gibbs Farm, or turn onto Toad Hill Road and decide at the far end whether to go uphill or down. Usually, we’d end up on Lover’s Lane, a road every bit as pretty as it should be with such a name. Back then, some neighbors there kept a small herd of goats, and we knew if we timed it just right, we’d see the goats being led back to the big red barn that sat down in the hollow at the base of an old meadow. Often, there was an antique tractor out in the field, too. 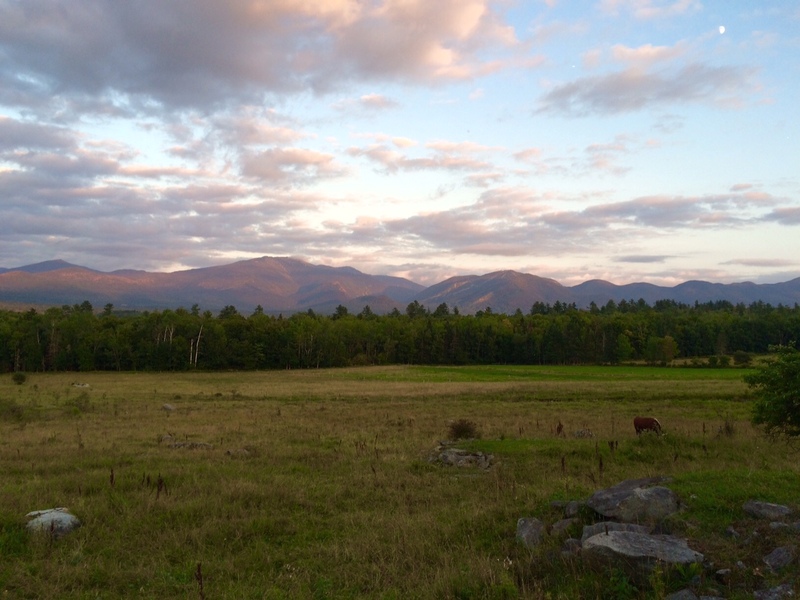 The barns, stone walls, and cleared fields are remnants of a more agrarian time. It seems impossible now that so much of a landscape that is forested was nearly treeless a century ago. As we drove, I was thankful for the quiet, but also for both the trees and the barns, the places for wild animals and tame ones to dwell – and for the many things to see that that would entertain the kids during these short outings that allowed us all to recharge. In the funny way things have of cycling around, we’ve taken to embarking on the occasional late-day drive again. My husband, who started this recent trend, calls these jaunts Neighborhood Appreciation Drives. The kids no longer need pre-dinner naps, of course, or help buckling in, nor do they have the same fascination they once did with John Deere Tractors – although they all know how to drive one now. But they are always eager to load up for a Neighborhood Appreciation Drive. Sometimes we embark on a new route, visit some unfamiliar scenic outlook. Sometimes we stop so the dog can splash around in the river. Always we pull over along the side of a backroad to visit a trio of horses who come to the fence and let us pat their soft noses and dusty necks in exchange for handfuls of fresh grass and clover leaves. These drives are less frequent than the Pony & Tractor Rides of years ago. They happen spontaneously, during pauses in busy schedules, usually during that magical time of day bridging sunset and moonrise, when colors shift in the sky and across the mountains. When we turn onto the familiar road to home, just as I did when the children were little and we wandered back from our Pony & Tractor Rides, I often feel a same sense of calm. 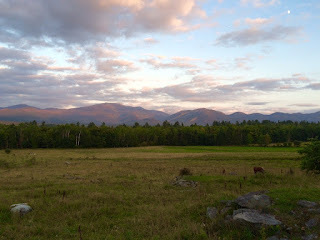 Perhaps this comes from the change of pace, the soft colors of the sky at dusk, the quiet time spent with my family. There is much here to appreciate. Original content by Meghan McCarthy McPhaul, posted to her blog, Writings From a Full Life. This essay also appears as Meghan's Close to Home column in the September 28, 2018 issue of the Littleton Record. We took a spontaneous, whole-family trip to the Seacoast last weekend, piling all three McPhaul kids and both adults into the minivan – along with the dog. Only the cat was left behind, and since he doesn’t even like the short drive to the vet once a year, he seemed OK with staying home. I am a planner. I like to know what the itinerary is before I head out on a journey. This natural tendency became more acute once I had kids and needed to plan for snacks and meals and bathroom breaks and all the other minutiae that come with traveling – even if just down the road – with small children. Now that the kids are older and relatively self-sufficient, I’m able to “wing it” a little more. But I still carry snacks and a first aid kit just about wherever we go. My husband, at least when it comes to family time, is more likely to improvise. He’ll tell the kids to grab what they need for any potential adventure – sneakers and swim suits, towels and lunch – and jump in the truck. He’ll take a drive without a pre-determined destination. He’ll change the plan as he goes – or just head out without one. If we’re going away for more than an afternoon, I make a list and check off items as I pack well in advance. He throws a few things in a bag five minutes before we walk out the door. We know each other’s tendencies – and that sometimes, often, they are in opposition to each other. Usually we make it work. 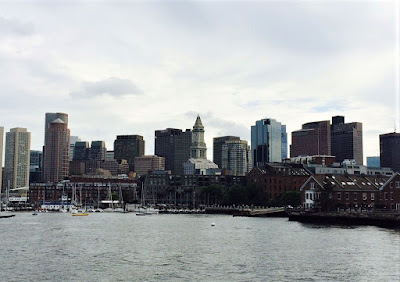 So, when he mentioned this idea of driving to Portsmouth for the day, with several potential things to do while we were there, I threw caution to the wind and said, “Let’s do it.” And then, of course, I packed enough snacks to last us at least three days. Along with visiting a friend who lives on the Seacoast and watching the hometown high school soccer teams, who were playing all the way down there Saturday afternoon, we also wanted to take our dog, Maggie, to the beach. Maggie turns two this week. We brought her home when she was a tiny bundle of golden fluff. She’d never been outside until the October day, just before Halloween, when we collected her from the Vermont farm where she was born. We placed her promptly on the grass. One sniff and she was smitten. She’s loved being outside ever since. One of Maggie’s favorite outside places is in the water. It doesn’t matter if it’s a lake, a river, or a muddy drainage ditch along the road. If her fur is wet, she is happy (unless a bath is involved). But she’d never explored the salt water – a fact of living in the mountains rather than by the sea. Always game for an adventure – whether a morning run, a family hike, or just a quick ride in the car – Mags eagerly loaded up Saturday morning. She stuck her head out the window as we drove down the road, wind in her face, ears flapping, eyes half-shut in ecstasy. She whined in anticipation as we drove through the Notch, hoping to get out and jump into a river or run along a trail. 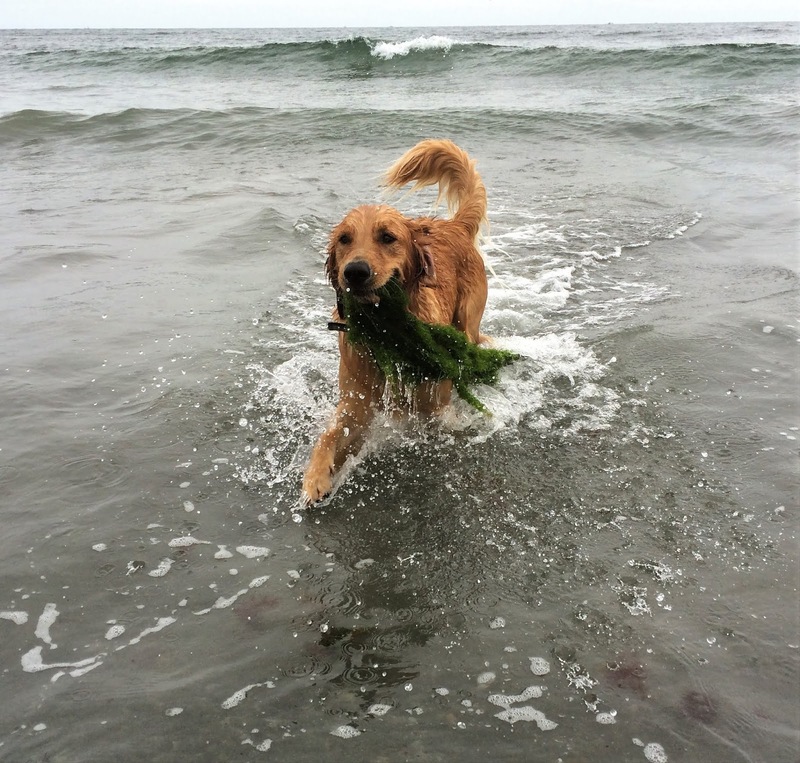 She leaped from the car when we finally arrived at the ocean, picked her way down the rocks to the beach and bounded toward the water. Then stopped and retreated as gentle waves broke and moved up the sand. Rivers don’t do this, nor lakes. Several times, Maggie trotted forward as the sea water retreated, then backpedaled clumsily as it rolled again onto the gray sand. Finally, she followed the kids as they waded in up to their knees. She chased the rocks we threw into the waves for her. Lapped at the water as she always does and shook her head in confusion at the briny taste. She got used to the waves, then realized the ocean is filled with treasures. She started coming back to the beach with long, bushy strings of bright green seaweed clenched in her teeth, proud of her discovery in this odd-tasting, always moving water. We humans stood and watched her antics, thoroughly entertained as we so often are by this goofy dog who chases butterfly shadows, begs for bits of broccoli, and is entirely obsessed with squirrels. Then we carried on with our unplanned road trip, meandering along the shore before turning inland to the next thing and, eventually, north toward home. It was fun to explore, even briefly, a different part of the state. Back home, contentedly tired, we all agreed the best part of the day was watching Maggie meet the sea. Original content by Meghan McCarthy McPhaul, posted to her blog, Writings From a Full Life. This essay also appears as Meghan's Close to Home column in the September 14, 2018 issue of the Littleton Record. As the clock ticked toward the final minute of play, I worried we were in for the disappointment of a loss. My daughter had been asking for ages for the chance to watch her favorite soccer player – Alex Morgan – in a live game. Now here we were, in a sea of #13 jerseys, and the U.S. Women’s National Team was down 1-0 and almost out of time. We waited anxiously amid the crowd of 21,000+, hoping for some last-second magic, yelling out to the players on the field just in front of us, hoping our cheers would inspire a goal. One of my faves, Carli Lloyd. 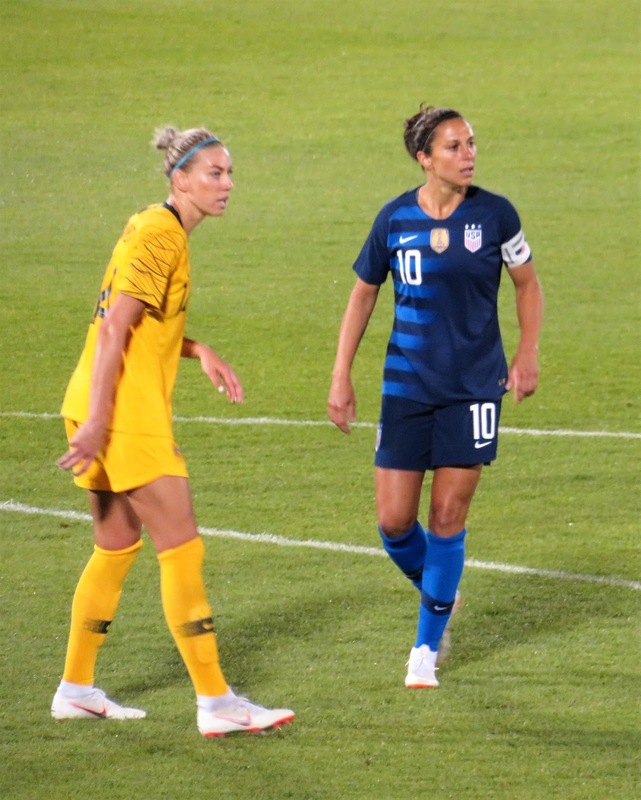 Three years ago, when the once-every-four-years Women’s World Cup was being contested in Canada, my husband and I considered making the drive to Montreal to watch the U.S. – the eventual winners of the coveted Cup – play. I’ve been kicking myself ever since that we didn’t load our then 6- and 8-year-olds into the minivan and head north for that. So, when I saw the U.S. Women’s National Team would be playing in Connecticut, I bit the bullet, bought the tickets, and headed south. My kids have watched a lot of soccer games with me in the living room. They’ve seen me sitting literally on the edge of my seat, watched me jump out of said seat in excitement, and heard both mutters of discontent and loud shouts of triumphant joy. Like pre-teens everywhere, the kids have become adept at rolling their eyes at their mother’s weird antics. But now they get into the games just as much – and often as vocally – as I do. Nothing compares, though, to being there live to watch the action – with several thousand soccer-crazed strangers. First, there was a meandering drive through a labyrinth of parking lots until we were finally directed into a spot, followed by the long walk to the stadium, where everything – from a hot dog to a taco to a bottle of water – seemed to sell for the bargain price of $5. Eventually, we got to the good stuff. The official walk-in by the starting 11. A live performance of the National Anthem. Pre-game fireworks on the field. The team huddling up before kick-off – just like the kids do before their games. Naturally reserved, my kids weren’t quite sure about joining in the “U-S-A!” chant that erupted at various points throughout the game, but they eventually did. We rose up for the wave as it undulated through the stadium. And, of course, we watched soccer. We groaned when Australia scored mid-way through the first half and rode the rollercoaster of great plays, hard charges, and near misses. Second half was the best, as the U.S. team controlled much of the play and attacked the goal at our end of the field. Alex Morgan was yards away. Megan Rapinoe took several corner kicks so close to our seats, she surely heard us cheering for her. Rose Lavelle, Crystal Dunn, and Tobin Heath dazzled us with their killer footwork. Carli Lloyd came on near the end of the game to a huge ovation. It all feels different when it’s happening right there in front of you, life-sized, without a commentator dissecting every move and the distraction of instant replay. I could tell by the kids faces, they were soaking it all up. As the minutes ticked up to 90, though, it seemed a lesson in disappointment was headed our way. And then, in the final minute of the game, on the last Rapinoe corner kick, Lindsey Horan timed her run and her leap just right and headed the ball past the Aussie goalkeeper. The crowd roared and leapt to its feet – we along with it – in an eruption of triumphant emotion not easily replicated in a living room. In that moment, the lesson shifted from one of disappointment to one of keep-trying-to-the-very-end. A tie, stolen from what had seemed like a sure loss, felt like victory. It was a little bit of soccer magic, more real because we were right there to see it – and feel it – happen. Original content by Meghan McCarthy McPhaul, posted to her blog, Writings From a Full Life. This essay also appears as Meghan's Close to Home column in the August 10, 2018 issue of the Littleton Record. For as many summers as my children can remember, their California cousins have flown east from their suburban home across the country to the relative wilds of northern New England. 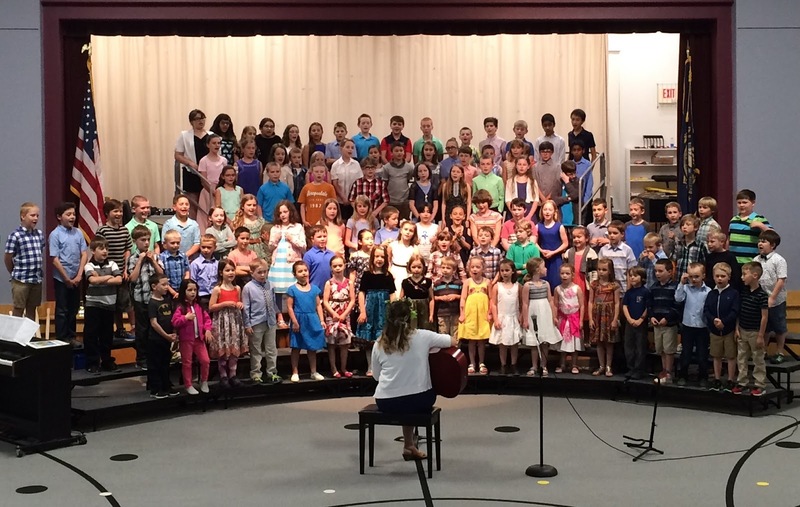 The arrival of the California cousins – or the Tennessee cousins or the Texas cousins – is an eagerly anticipated event, one the kids talk about for weeks beforehand. My mother, who is an only child, often says she doesn’t fully grasp the relationship between siblings, even after having raised three of them. I feel the same way about cousins. Considering both my parents come from Irish-Catholic families (and each has dozens of cousins), it seems incredible that I only have three first cousins. I love my cousins dearly, but I’m stuck age-wise between them and their kids. We had regular family gatherings when I was growing up, but the age gap meant we weren’t running around together playing capture the flag or giggling like crazy over nothing much, which is what my kids spent much of the middle of July doing. This year we met the California crew on Cape Cod – two families with kids ranging in age from 9 to 16 years, a pair of grandparents, and another aunt and uncle thrown into the mix – for a week of beach time. We returned home to New Hampshire to find my husband’s Texas cousins and their kids visiting, which meant a happy continuation of cousin fun. 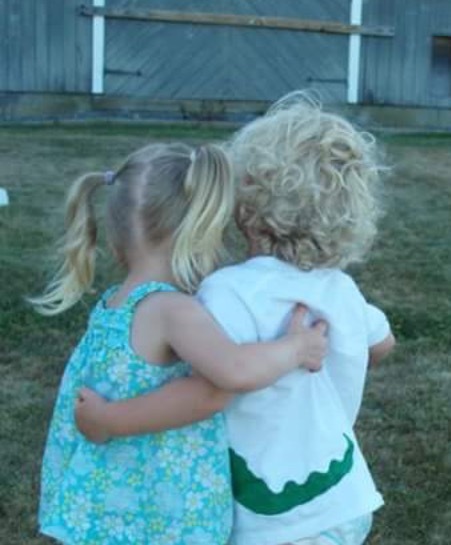 The cousin bond is special – not quite sibling, but different than friend. Maybe it is the novelty of only seeing each other once a year (or less often), or a sense of familial loyalty, or that they share some of the same stories. Whatever the reasons, the kids fall into the relationship each visit as if it’s the most natural thing in the world. 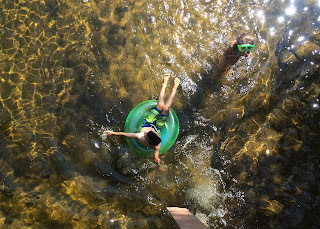 In past years, when the California cousins are on the East Coast, the kids have established a regular list of things to do – hiking Bald Knob, kayaking Long Pond and looking for crayfish and salamanders, toasting marshmallows at the backyard firepit and watching fireflies flit through the summer night. This year, we got to introduce the California crew to some of our favorite haunts on Cape Cod, where we’ve gone for a week each of the past eight summers. We visited old favorite beaches and explored new ones. We played mini golf in one of our regular (and not so busy) places and checked out a new course down the road from where we were staying. We got ice cream at the same place my family did when my brothers and I were children and watched the kids run around on the beach we played on when we were little. We even found a new candy store to substitute for the annual cousins visit to Chutters. From our rental house at the Cape, the kids could tramp down to the beach whenever they felt like it. They usually paired up – one New Hampshire kid, one California kid – in a revolving mix of personalities and activities. My kids look up to their older cousins, all teenagers now, and the older kids seem to appreciate the chance to do kid stuff for a week with a slightly younger crew – and no other teenagers to impress. The timing of this year’s cousin visits from various corners of the country meant that bidding a melancholy adieu to the California crew was quickly followed by happy anticipation of hanging with the Texas contingent. Before we’d even walked through the door back home, the kids were clamoring to see their Texas cousins, who have visited the past few years. Forget recovering from vacation, we jumped back in to communal dinners with 20 people – including 10 kids ranging from baby to 13 years old. There were impromptu soccer matches and rounds of hide-and-seek and other made up games. The kids piled into the pickup truck to drive through the field and visit the neighboring cows. There was plenty of general goofing around. With all the kids growing older, I’m not sure how many more years of week-long summer visits we’ll have. But I know my kids will remember fondly these wild weeks of cousin fun well beyond childhood. Original content by Meghan McCarthy McPhaul, posted to her blog, Writings From a Full Life. This essay also appears as Meghan's Close to Home column in the July 27, 2018 issue of the Littleton Record. When I was 9 or 10, I beat an old man at cribbage, high on a mountain. I have no recollection of this encounter, but my father swears it happened, and so it must be true. This was during one of my family’s multi-day hiking outings when we’d string days on the trail with a night or two at an Appalachian Mountain Club hut. Apparently, the old man was both thrilled and surprised to have been out-pegged by a little girl. Maybe he’d gone easy on me. I have no idea. 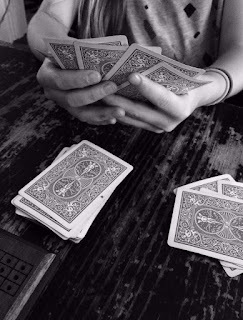 The cribbage story is one of the tales my family tells of these outings – along with my older brother’s disagreement with the green spaghetti we ate one night and my younger brother filling his small, teddy bear-toting backpack with rocks along the trail. So I remember it without actually remembering. I also don’t remember learning to play cribbage, although I imagine this happened over a series of winter nights spent in Franconia, where we came to ski on weekends – and where, when I was growing up, our television received only one or two channels, and that only if the cloud cover was aligned perfectly over the unwieldy antenna on the roof. In the absence of television and smart phones (heck, back then we shared a party line with the other half-dozen houses on our road), we either read or played games through the long winter evenings and the occasional summer nights spent at the house. There were rousing, post-supper, multi-generational rounds of Balderdash and Pictionary and Trivial Pursuit when friends were over. And, apparently, quieter and more contemplative contests over the cribbage board when fewer people occupied the living room. Despite growing up in the digital age, my children have become quite the little card sharks in recent years. I will take very little credit for this, as I don’t have the patience to teach card games, with all their intricacies, to anyone. Some games I have learned – or re-learned – along with the kids. My husband has taught the kids to play Hearts and what we call Bull Poop (rather than the more adult-language name for the game), along with a couple variations of solitaire. He and my parents have also worked to hone the kids’ cribbage skills. Friends have taught them to play Kings in the Corner and Beggar My Neighbor. Most nights after dinner, at least one of the kids asks to play some card game or another, and in these summer evenings that seem to stretch long between dinner and bed, we usually fit in a round or two of something. Already, the children have developed a sense for card game strategizing that often escapes me. They delight in holding the Queen of Spades and giving her away at the perfect time in Hearts, and they usually know someone is trying to “shoot the moon” before I do. They can often tell when someone is bluffing at Bull Poop and have learned to count ahead to see which cards they should try to unload at which turn. Last week, the littlest one wanted to learn to play cribbage. She played against a sibling with my husband’s help and was soon ready to tackle the game solo. In her first game on her own, she beat me, and was on the way to skunking me before I managed to close the gap in the last hand. I think there’s probably some educational value in the card-playing – basic math, planning ahead, having to choose what to keep and what to let go. Mostly, though, it’s just a fun way to pass the time together – wherever we are. A deck of cards slips easily into a pocket or a purse – or a backpack. Later this summer, we have a two-night hut trip planned in the mountains with another family of card-playing friends. We’ll pack a couple of decks of cards and our smallest cribbage board. 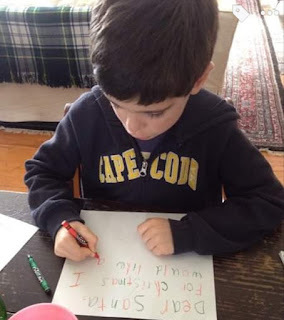 Perhaps one of the kids will challenge a stranger to a round, and that will become part of the story we tell many years – and many rounds of cribbage – from now. Original content by Meghan McCarthy McPhaul, posted to her blog, Writings From a Full Life. This essay also appears as Meghan's Close to Home column in the July 13, 2018 issue of the Littleton Record. Summer, it seems, has come suddenly this year. Or maybe that’s just my excuse for feeling like I’m far behind where I should be this second week of May. For that, I’ll blame the April showers, which were of the snow variety right up to the last day of the month. Two days after April’s last snow, we had beach weather: sunny and 80 degrees. It feels like we skipped spring and went straight from winter to summer. There was hardly even a Mud Season this year! Suddenly, the lilac leaves have popped, the bright green shoots of the daylilies along the west side of the house are 10 inches high, and the lawn needs mowing. I’ve taken advantage of this week’s warmth and sunshine to try to catch up, but most of the house – and yard – is in that between-seasons flux of disarray. My heaviest sweaters are put away, but I still have to dig through the summer bin to find my shorts. 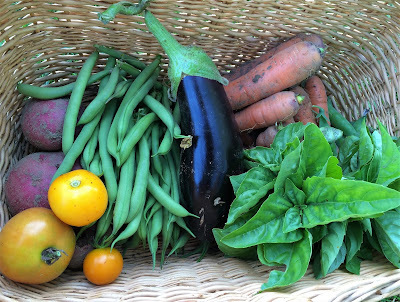 I’ve started turning the soil in the garden, but haven’t planned out which veggies I’ll plant where. Everywhere I look there is something to be done. In some ways, I like this – I can pick which chore or task to tackle based on my mood and the time I have to devote to it on a given day. There are no deadlines, but plenty of work. This week I have carried the snowshoes and sleds up the narrow stairs in the garage to store them until whenever next winter’s first snow arrives. Skis have been, finally, waxed and strapped together and stored out of sight. The garage has been swept out and rearranged, allowing easier access to gardening tools and bikes. Soccer balls have taken the place of snow sleds, and golf clubs have replaced skis. I even found the beach towels the other day as I was rearranging the storage area to stow away the winter gear. Snow shovels have been put away, replaced by rakes to clean up winter’s deposit of fallen twigs and grass thatch. The pea trellis is loaded into the garden cart, waiting for me to stake it into the ground and drop those first seeds of the season into the warming, waiting earth. There are, of course, plenty of weeds to be pulled from the perennial bed. Summer may have arrived all of a sudden, but I’m still getting there one step – and one task – at a time. Original content by Meghan McCarthy McPhaul, posted to her blog, Writings From a Full Life. This essay also appears as Meghan's Close to Home column in the May 11, 2018 issue of the Littleton Record. We ripped a good portion of the wild rose hedge out when we first moved in, much to the dismay of this house’s former owner. The Rosa rugosa had hugged the inside curve of the driveway before arcing around the back of the garden wall in a tangle of thorns and flowers, separating a cultivated perennial bed from the wilder field beyond. But we were transforming part of that front field to mown grass, the better to hold the venue tent for our upcoming wedding. We spent countless hours that spring and summer reconfiguring the garden, and anytime we got within a foot of the slate wall we’d find roots from the rugosa, looking to spread if we’d only let it. Thirteen years later it seems to have settled in to the space we’ve allowed it – a wide swath remaining along that bend of the driveway, stretching for about 30 yards before stopping to leave room for the lawnmower to pass between its thorny branches and the garden wall. From the side window of my childhood bedroom, I could look out at other roses: a mostly tidy jumble of antique rose bushes at the edge of the yard. In my mind, they are a mix of bright and more subdued hues and smell heavenly – like summer embodied: sweet, hot, ephemeral. The roses in our yard now are not so refined, but just as lovely. The wide hedge is its own little wilderness, and within its realm are all sorts of wonders. In Fall, the leaves of the Rosa rugosa are the last to drop. Long after the bright maple and yellow birch leaves have sifted to the ground, when even the tamaracks have dropped their needles, the rose hedge’s rusty leaves finally drift downward. The naked brambles reveal birds’ nests tucked deep within. Through spring and summer and into fall, the birds maneuver deftly through the twiggy branches, disappearing within to build nests of sticks and grass – or, sometimes, just to take shelter – wisely beyond the reach of potential predators. Even now, as we wait for the rose hedge to rebound from the weight of winter snow piled onto it for many long, cold weeks – before the green leaves unfurl, before the time for laying eggs – the birds take shelter there, darting within the still-brown brambles when a car comes past or a dog runs near or children yell to each other in the yard, a bit too close for the birds’ comfort. They flit from bare lilac branches to rose hedge to serviceberry tree and highbush cranberry. The chickadees, year-round residents here, have shifted to their spring song now. Goldfinches – waiting, like the leaves and flowers, to show their summer colors – call “potato-chip, potato-chip” as they fly about. Song sparrows alight on different perches, their bright melody seeming to welcome spring, even on mornings when the temperature dips below freezing. Soon, we will begin peering beneath the garden-side edge of the rugosa hedge, looking for the curled over spathes of Jack-in-the-pulpit. Several of the quirky plants poke up through the sheltered soil there each late spring, first just pointy leaves reaching skyward, then growing tall and taller and curving protectively over the spadix. 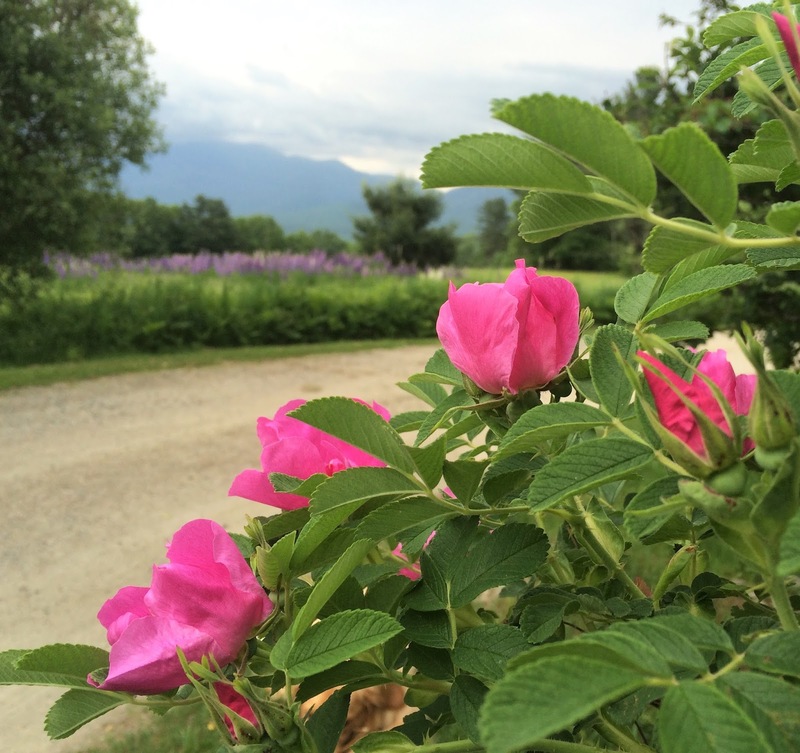 As summer bursts into color – a thought that seems distant with the memory of snow still so fresh – the rugosa’s swath of green leaves becomes peppered with yellow-centered pink blossoms, their scent permeating the yard and floating up to bedroom windows. A couple of wild raspberry canes mingle with the rose thorns, their juicy berries worth the scratches it takes to reach them. Bees, earlier fed by the apple blossoms of the old orchard out back and a multitude of flowers growing wild through the yard and fields, buzz from rose bloom to rose bloom. The bees – and late summer butterflies – come to the rugosa even after its flowers have faded, to feast on the asters whose tall stalks twine up through the hedge. The bees cling tiredly, during these last warm days, to the asters’ fringed purple blooms as summer declines into chilly nights and shorter days. But all that is in the seasonal distance. Spring has been late in coming this year, April serving up a slow thaw and lingering show showers. May, on the horizon, offers hope of greening leaves and a landscape slowly changing, from the tired brown left by winter’s cold and melted snow to colors, subtle at first, gradually blossoming into a spectrum of hues. 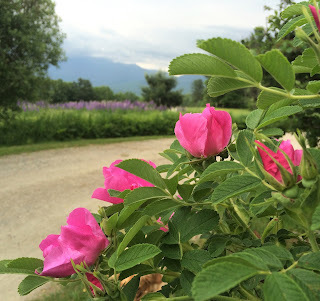 In the hottest, brightest days, the Rosa rugosa, with its labyrinth of flora and fauna within and around it, will bloom bright pink and divinely scented. Fleeting as summer, yes, but a sweet something to look forward to during the still whispering days of spring. Original content by Meghan McCarthy McPhaul, posted to her blog, Writings From a Full Life. This essay also appears as Meghan's Close to Home column in the April 27, 2018 issue of the Littleton Record. 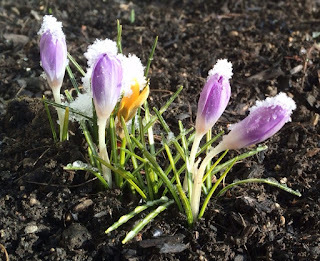 These last few weeks, I’ve felt a bit like the tiny crocuses outside the living room window – alternately basking in the warm spring sunshine and huddling against the stubborn winter cold. My first peek out the window in the morning now is as likely to reveal a giant flock of robins hopping around the yard like an army of wind-up toys as it is a fresh coating of snow. During these transitional days, I am often as indecisive as the seasons, still enjoying winter’s last thrills, even as I look forward to and prepare for spring – whenever it might arrive. On those warm-sun days, if I have the time, I weigh the options – an outing with the dog or one more trip to the ski hill for fast turns down quiet groomers? When the day warrants time only for a quick outing, I’ve traded in forays through the forest by cross-country ski for slow runs on backroad routes I haven’t traveled much since November. I try to identify the birdsong floating through a landscape that was recently winter-quiet and to remember where I usually spot the first wildflowers – often escaped from some long-ago garden. On longer treks, when the sun beckons the dog and I to climb higher on still-snowy trails, I can’t help but think ahead to summer adventures. 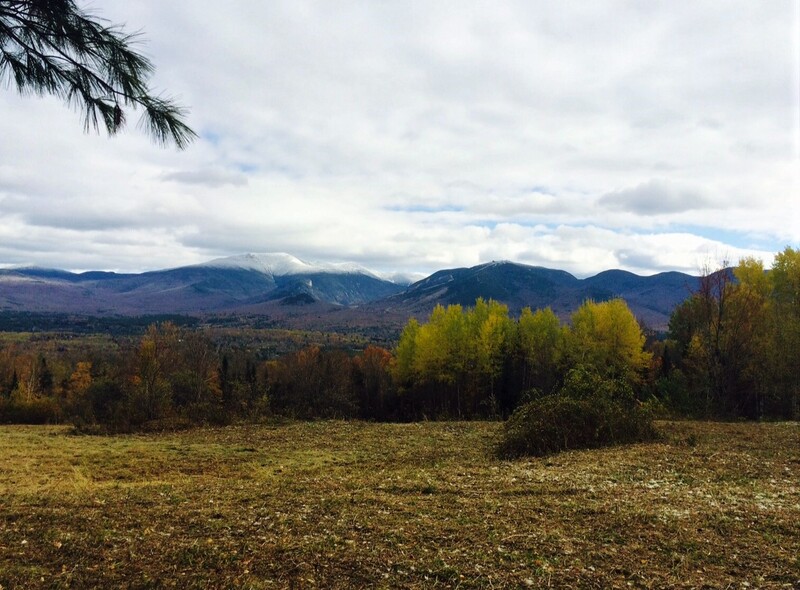 Which tall peaks, now still blanketed in snow, will we hike during the green months? The kids have had their bikes out the last few weeks, as the afternoons stretch longer between school ending and the sun setting. They ride over mud and snow, skid out on the ice, remember the exhilaration of flying downhill on something other than skis – and think about summer rides to come. The ski gear is still out, in case we are inspired for one more day on the slopes. The ski boots by the big radiator near the front door join a jumble of muck boots and sneakers, flipflops and soccer cleats – any of them potentially required on any given day now. We’ve lugged the sleds and snowshoes back into the garage, but haven’t yet hauled them upstairs to their warm-weather storage, lest there’s one more good snowstorm that merits their use before spring really settles in. Experience tells us that snowstorm could come as late as Memorial Day – or not again until next fall. 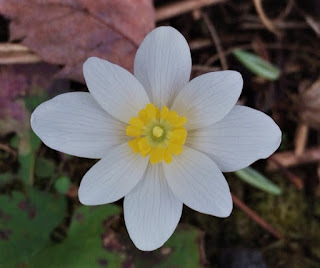 Some days I am impatient for the seasons to get on with their shuffle, for sunshine to prevail over lingering flurries. On other days, I remind myself any snowflakes falling now won’t last long in the strengthening light and lengthening days. This, the dog knows – or, more likely, she just doesn’t care. She takes pleasure in whatever she finds, running gleefully along dirty roads, traipsing through puddles and scampering hopelessly after the chittering red squirrels. She stares intently through the windows at the newly arrived birds hopping around the yard. She laps happily in the recently-thawed stream near our driveway, trots mindlessly through the mud, and then – as if it’s the best thing in the world – rolls gleefully in any big-enough patch of snow she can find. Perhaps she remembers that snow will soon disappear. Spring is coming. Next week, maybe, or the week after that. Whenever it gets here, we’ll be ready. Original content by Meghan McCarthy McPhaul, posted to her blog, Writings From a Full Life. This essay also appears as Meghan's Close to Home column in the April 13, 2018 issue of the Littleton Record. Our group must have looked quite the spectacle from the tram cars: a gaggle of the littlest ski racers making their way down the mountain’s toughest trail. A few of our crew ripped right down D.J.’s Tramline, not the least bit phased by the rock drops and snowy bumps as high as the skiers who were maneuvering around them. Others struggled – more with their own nerves than with the technicality of the skiing. These are, after all, Cannon kids; they’ll ski just about anything. After the descent, as we stood between the tram car docks waiting for a ride back to the summit, I had the kids look up at the trail they’d just skied: strewn with boulders and exceedingly steep in some areas. Whether they’d been the anxious ones or the confident skiers moments before, they all seemed to puff up just a little bit gazing back up the mountain. That was my first time down Tramline, too, and it was, until Saturday, the only trail on the mountain I hadn’t skied. At least the only one on the trail map. That trail map has changed a good bit since the days when I was one of the littlest ski racers here. Maybe it’s because I lived (and skied) away during college and for several years after that, or because I’ve been exploring the mountain with my own kids as they have grown and progressed in their skiing prowess, or because I coach with a guy who knows every nook and cranny here – on the trail map and off – whatever the reason, I find joy in this adventuring. Last Wednesday my kids had a rare snow day from school, and we spent a good chunk of it at Cannon, arriving to find snow so deep it was hard to open the car doors (and we later had to dig said car out of the unplowed spot we’d parked in early that morning). We made one run down a wide-open trail before the kids dragged me into the woods, and we spent the rest of the day exploring. I grew up skiing this mountain, although we were weekend commuters, so too far away to make it on a snow day from school. Back then, there were no glades. Sure, there were a few secret stashes off the saddle between Cannon and Mittersill, and once the latter area closed and the forest grew back up around trails and lift lines, there were some hidden spots there, too. But certainly nothing on the trail map. 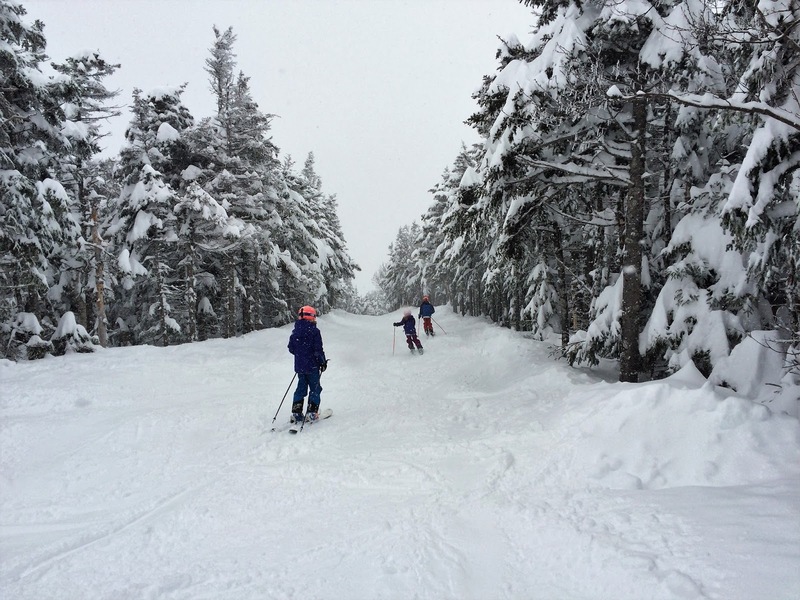 Now Cannon lists 22 glades on its trail map, ranging from short, beginner woods runs to long, tight, tricky tree skiing. Wednesday we headed to the top to ski the glades there, then over to Mittersill to ski more glades, and finally ended the day on the old Tuckerbrook trail, cut back in the 1930s and maintained, often clandestinely, in the decades since. This is the one off-piste trail I remember from my own childhood. Skiing it is a rite of passage. Tuckerbrook is not a particularly hard trail, but it is an adventure. You have to hike to reach the entrance, it’s not groomed, and there’s a long traverse out at the bottom. You also need to line up a lift back to the base area, as the trail spits skiers onto a dead end back road a couple of miles from any ski lift. Although a few others had been in there by the time we reached Tuckerbrook Wednesday, it was some of the best skiing we had all day. As grateful as I am for the manmade snow that allows some consistency to ski season, there is nothing like the real stuff – and that’s what you find on Tuckerbrook and in the glades. So it was fun to continue the adventuring last weekend, both for my kids and their ski groups and for the young skiers I help to coach. 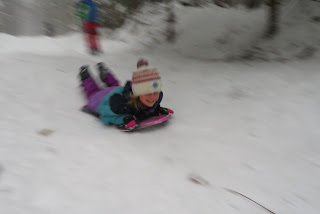 My youngest daughter took another trip down Tuckerbrook. My oldest skied a different unmapped trail. Our group snuck through woods so tight branches smacked our legs and cheeks as we made our way to hidden glades, turning around trees and rocks, finding soft snow everywhere we went. I don’t know about the kids, but I ended the weekend tired – and fulfilled. And grateful that, on a mountain with as many secret stashes as there are named trails, there are plenty more adventures to chase. Original content by Meghan McCarthy McPhaul, posted to her blog, Writings From a Full Life. This essay also appears as Meghan's Close to Home column in the March 23, 2018 issue of the Littleton Record.